So, as the game starts Link has washed up on the beach of an island and there’s a sparkly little fairy running flying about his head. Once he’s on his feet the situation gets retold and a few new characters are introduced – soon enough Link teams up with Navi Ciela, the fairy, and a greedy pirate called Linebeck who loans Link his ship. The trio sets off to find the Ghost Ship, resurrect the Ocean King (a local god type character) and rescue Tetra. The plot isn’t anything especially interesting really and follows the same kind of lines as pretty much every Zelda game ever – rescue the girl, stop the bad guy, run about smashing pots and somehow avoiding the realistic threat of an ASBO. The plot isn’t really the major draw though, no matter what you’ve heard, and Nintendo has obviously gone with the ‘if it ain’t broke, don’t fix it' attitude. Fair play to them, the story is enough to pull players through the game and is interesting enough to series newcomers, while fans will just appreciate more of the same beautiful gameplay. If you’ve ever played a Zelda game before then you’ll have a reasonably good idea of what to expect in terms of game design. If not, then you’ll have to prepare yourself for a game which fuses almost every single genre together into a well told mishmash. 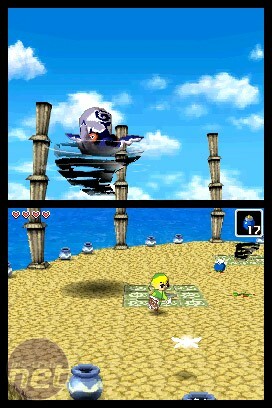 The Zelda series is most often described with the lamentably generic phrase ‘action/adventure’, with some people going so far as to call the game an RPG. 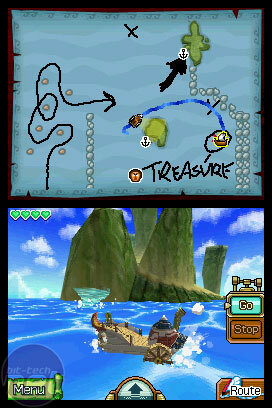 In actual fact though, it’s neither of these and Phantom Hourglass is a perfect example of why not. The game combines elements from almost every established genre, blending them all seamlessly across both screens. The control method for the game is both simple and elegant and, more importantly, doesn’t use the somewhat hand-cramping combination of both buttons and stylus, as so many games on the DS do. Instead, the game focuses on just the touchscreen, bringing Ciela into play as a convenient bridge between interaction and narrative. If you want to move around the game world, which is shown only on the bottom screen, then you simply show Link where to go with the stylus. Ciela rushes on ahead to where you were pointing and Link tries to keep up. If you want to attack an enemy, you do so by slashing it with your sword or tapping it, drawing circles either around Link or at the edge of the screen to use spin attacks or dodges. It is, quite simply, the most utterly immersive and brilliantly realised way to control a game like this (on the DS) and the system is finely tuned to be both forgiving and taxing at the same time. The only problem you might have is that your own hand could get in the way of the screen, but the option to use a longer stylus or just have slightly less chubby hands neatly solves this. The control system is great though because it doesn’t just use the touchscreen and takes advantage of other more neglected aspects of the DS design. The dual screens are useful in boss fights as we’ve already mentioned, but the top screen is also used as a map which Link can edit by pulling it down with the D-pad and scrawling notes on it. The game also uses the microphone, the most forgotten piece of hardware on the DS, at various points. There’s one part of the game in particular where Link is trying to save a fortune-teller who is trapped in her own storeroom and he has to shout instructions to her. The microphone plays a key and fun part in both solving the puzzle and making gamers look like even more of an idiot.